Available in classroom and online: Preview this workbook immediately. Identifying and hiring skilled, intelligent team members is challenging. You have expended considerable resources to find the talented people, but how do you ensure that they understand and mesh with your company’s culture and produce results quickly? Giving your team the skills they need to understand your organization’s culture and the tools to become highly productive is critical. The professionalism of your team is essential to help attract and retain customers, and, therefore, to the success of your organization. Getting consistent, professional behavior from your team members is essential to achieving team and company goals. Giving your team members the ability to understand their role in the organization and how professional behavior is defined will allow them to develop self-evaluation skills as well as a commitment to change. 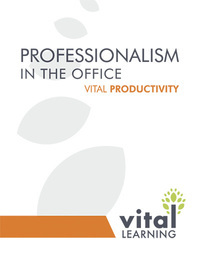 The Vital Learning Professionalism in the Office™ course provides the tools to develop the essential skills required for personal and team success in today’s work environment. These skills include professionalism, effective communication, time management, and organization. A focus on building these skills helps supervisors, team leaders and managers develop a productive team that is prepared to contribute to the organization’s success. 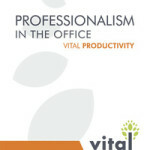 Click the “e” to immediately enroll and begin the Professionalism in the Office online course. Employeeswho complete this course are eligible to earn college credit toward an associate’s or bachelor’s degree through the University of Phoenix.